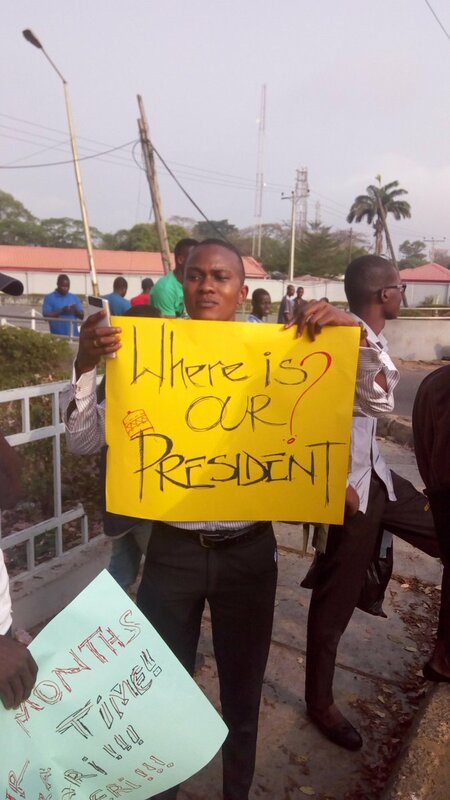 Afrikanist: ONUKWULI; Where is President Buhari? I was about 5 years old when I first heard the name Buhari. It was in 1984 when he became the Military Head of Nigeria. Maj.Gen Muhammadu was not the first military head of state but his regime was inauspicious as scarcity rife and the black market thrived. Common goods became luxury and his regime was a fight against indiscipline as soldiers were always at bus stops to enforce long Queues and people were flogged for littering ( this is common with other military regimes where the Rule of law is suspended). I noticed the demeanour of my parents; it was full of Fear & Anxiety and they will wake up early each morning and pray in whispers to God for him to 'arrest' the head of state. Monthly salaries hardly come by so I saw bread disappear from the breakfast table, beef was rationed and tin milk became costly that our nutritional needs took solace in vegetables,beans and soy milk. Fast forward to 31years later before the Nigeria general election, the APC party announced Maj.Gen Buhari as it's Presidential candidate against the incumbent president. The APC party was meticulous in picking their candidates for presidency and vice presidency; Maj.Gen Buhari is from the North & a Muslim while Osibanjo is a Christian from the southwest and this careful selection will satisfy any ethno-religious sentiments. He was painted as the 'Messiah' who will save Nigeria from corruption and Bokoharam. My father Onukwuli was a supporter of Buhari, I wasn't surprised since they were reports of Corruption and massive looting of public fund during the tenure of the incumbent president. People wanted a change but were afraid of the consequences and my father in his own words said 'shall we endure yet another 4 years of Corruption because we fear the unknown? If the unknown comes and underperform then we will vote them out'. The people finally voted out the incumbent in an election that was largely accepted as free & fair. The citizens were happy as it is uncommon in Africa for an incumbent to step down for an opponent without war. And Maj.Gen Buhari became President Buhari but the change in status is not the 'change' Nigeria longed for, they wanted something magical and quick like the snap of one's fingers. He was under the watch of the citizens and majority participated actively in politics. It took PMB a long time to appoint his ministers and that was his first mistake and this flawed his first year in office. The first real test came when there was sharp fall in oil price (it started from the previous tenure) and Nigeria is a country whose Economy depends wholesomely on oil. Niger Delta militants started bombing oil pipelines and Nigeria's oil reserve dropped, it was catastrophic. He wanted to diversify the Economy but his approaches were outdated, he introduced a new forex policy that favours a few Elites, they buy dollar at a cheaper rate and sell it costly in the black markets. The black market flourished but it doesn’t have any impact on the Economy. In an effort to increase local production, foreign goods were banned and high custom duty was placed on a selected few. Traders complained about the dollar price, the cost of living became high as Rice, Bread and tin milk became costly but it was obvious that the President was not concerned about the Economy of the country as he was busy fighting 'corruption' and travelling to other countries for health care and other businesses. The Economy went into Recession, businesses folded up, unemployment rate increased and the presidency blame it's inefficiency on the mistakes of past 'corrupt' leaders. All promises failed but the people were optimistic, my father will say 'let's give him more time, it's barely 2years' but the President seem deaf to hear the cry of the Masses the same way he acted towards the fulani herdsmen killing farmers in Southeast, the killing of IPOB members by soldiers in Onitsha and Port Harcourt, and the killing of the Shiite Muslim group by soldiers who buried their corpse in hastily dug graves. Of course he was busy fighting terrorism and locating Chibok girls at specific period in an effort to pacify the people. It will be wrong to say PMB was responsible for the killings and bloodshed and it's another thing to notice how he ignored such occurrences and waited until after much criticism before he condemned the killing of farmers by fulani herdsmen. It is a natural mechanism to be self preservative and self criticism is not something that is associated with governing but it is good to always criticise government and in so doing, its an acknowledgement of imperfection. Onukwuli is an Igbo name that translates to ' let the mouth speak ' and it can also be referred as ' speak freely '. It was a very common name during the colonial era given to freedom fighters and Activist but now my poor father keeps doubting the ' viability ' of his own name and Freedom of speech is just something in paper,Activists who talked against government were threatened. About 3 weeks ago, PMB embarked on a 10 - day medical leave in London ( our health care system is not for Elites ) and he was supposed to resume office on Monday 6th February but while the people were anticipating his return he had already written a letter to the National Assembly about a postponement of his return indefinitely. Now in a country where $ 1 = #500 and the cost of internet data is so high, the most asked Questions on Google by Nigerians are ' WHERE IS BUHARI? ' 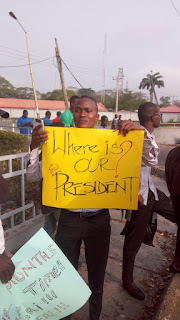 & ' IS BUHARI DEAD? ' .